Game addicts, stock analysts and workaholics who work long hours in front of the computer should give their eyes a rest and a nice massage after a long day staring at the computer screen. 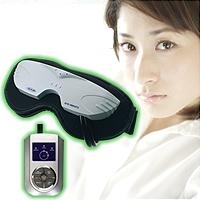 Designed particularly to ease tired eyes, this interesting eye-massager, Eye Vibrato from Japan, could be the ideal choice compared to eye drops or ice packs. Weighing about 162g, Eye Vibrato just fits nicely on the user’s head. This eye healing device offers buttons to control the heat, vibration and light air pressure. 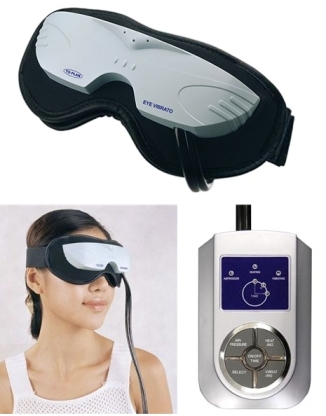 Users can use the corded remote to configure the level of vibration, heat and light air pressure to provide the best comfort for their tired eyes. The device also offers 5, 10 and 15-minute massage durations for users to choose from. Instead of waiting in a long queue to see a massage therapist, Eye Vibrato could be perfect to heal strained eyes anywhere and any time at one’s convenience. It just costs $65 to bring the luster back to the windows of the soul.